How do you measure the performance of a business analyst? 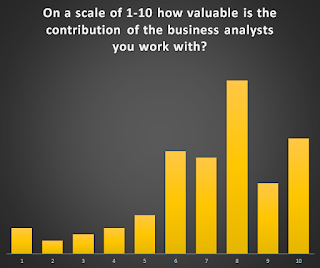 A key idea in my thinking is that a business analyst contributes as part of a broader team. The implication of this is that an important part of measuring performance is getting feedback from the people you work with; your customers, suppliers, partners and team mates. I ran survey based on this idea last year. The results I present below are from 108 responses. Using Net Promoter Score as a framework for assessing this survey the business analysts in scope of this survey have an NPS of -6. Room for improvement! Our survey gave us the following responses to help derive the NPS score. I’ll write about the comments behind the scores after I have run a second one. I’ll probably publish in January at www.BetterProjects.net. I’d appreciate you sharing this with your business community and your fellow business analysts to see what comes up. Will we beat -6 this year?